- Leader of War Veterans loyal to the cause of the party, Cde Patrick Nyaruwata apologises to President Mugabe and Dr Amai Mugabe for what happened in Bulawayo. 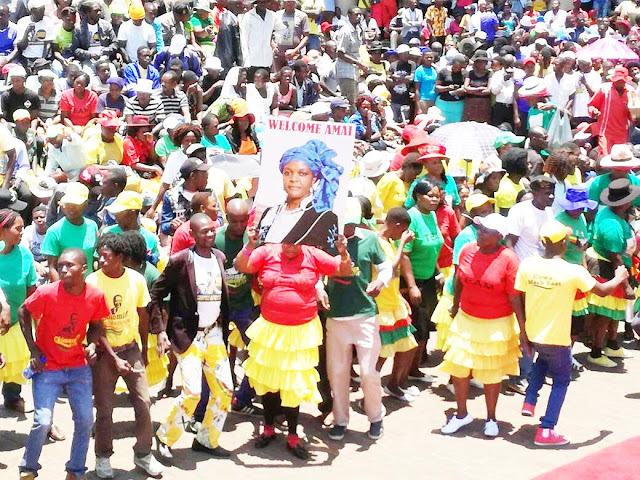 In Bulawayo last week a handful of rogue youths suspected to be members of former Vice President Emmerson Mnangagwa’s Team Lacoste booed while the First Lady Dr Amai Grace Mugabe was addressing the Bulawayo Youth Interface Rally. 13:05 - Cde Nyaruwata has urged President Mugabe not to hesitate to take corrective measures against deviants. 13:06 - Speaking on behalf all Ministers of State for Provincial Affairs, Minister of Manicaland Provincial Affairs Cde Mandi Chimene mocks former VP Mnangagwa for attempting to skip the border to Mozambique. “He is a border jumper,” says Cde Chimene. 13:10 - Cde Chimene implores President Mugabe to descend to provinces and cleanse them of Lacoste members . . . adding that they will assist by compiling names and forwarding them for action. 13:14 - Cde Letina Undenge, standing in for Cde Thokozile Mathuthu pleads with President Mugabe to ensure that the constitution is amended to make a provision for the inclusion of a woman in the presidium. 13:19 - According to Cde Undenge, men, who are in charge of legal affairs are stalling progress because they have been working with the fired former Vice President Mnangagwa. 13:21 - Zanu PF National Political Commissar, Cde Savior Kasukuwere has invited provincial chairs to give brief remarks. 13:25 - Bulawayo Provincial Chairperson Cde Dennis Ndlovu speaks of his embarrassment during the rally on Saturday. As such, he called for a meeting the following morning with the aim of stumping out factionalism. The province recommended the expulsion of former VP Mnangagwa and his allies from Bulawayo.